Good wages. Excellent job prospects. Opportunities to earn while you’re in training. Masonry jobs offer a quick ticket to the middle class for workers and the opportunity to see real, tangible results from laboring each day. Employers are struggling to find bricklayers, and a growing demand for new construction is putting even more pressure on the industry to recruit and train new workers. To replenish the pool of skilled masonry labor force, the industry must combat years of state neglect of career technical programs and a societal bias against masonry labor force. Renewed investment in career technical programs at the high school and post-secondary level, efforts by contractors and organized labor are all working to address the shortfall of masonry labor force, but the challenge posed by years of declining recruitment is steep. The construction industry has a dire need for more skilled masonry workers. According to the Bureau of Labor Statistics (BLS), employment for masonry workers is expected to grow by 12 percent, adding 34,500 jobs between 2016 and 2026. Growth in the industry is being driven by construction required to meet the needs of a growing population. The number of new masons entering the market isn’t enough to meet this demand. In fact, it can’t even meet current demand. Masonry contractors are having trouble filling the open positions, and retirements among Baby Boomers are exacerbating the problem, as this generation makes up a huge segment of the current masonry labor force. “The average age of a brick layer is 54,” says Jay Smith, president of the Bricklayers Union Local 8 of the Southeast. The scarcity of masons is part of a wider shortage of skilled construction labor nationwide. A 2015 study by the Associated General Contractors of America found that nearly 80 percent of the businesses the organization surveyed struggle to find skilled laborers. In the survey, 55 percent of masonry contractors reported having trouble filling jobs. According to the BLS, the median pay for masonry workers in the United States is $41,330 per year, and the top 10 percent of workers earn around $74,310 per year or more. Brick masons and block masons have the highest median wages of masonry workers – around $49,250. Most masonry training programs allow students to become qualified skilled laborers in two years or less, and some provide job opportunities for students while they are training. With good pay, a quick path to becoming qualified and plentiful employment prospects, it seems that masonry should be an appealing career path for many young workers. Years of declining funding for masonry training programs caused by an increased focus on college preparatory courses have also reduced the number of high school students exposed to the trade. The Great Recession also forced many skilled laborers out of the construction industry, and many are not returning as they’ve found other opportunities. There’s also the fact that masonry isn’t for just anyone. The trade requires mental discipline, physical strength and endurance that not all people have. “Masonry is a very lucrative profession, but it’s also a very labor-intensive profession,” Steve Mitchell, founder of the Maine School of Masonry, says. After spending years as a masonry contractor and teaching masonry in public schools, Mitchell started the Maine School of Masonry in 2005. 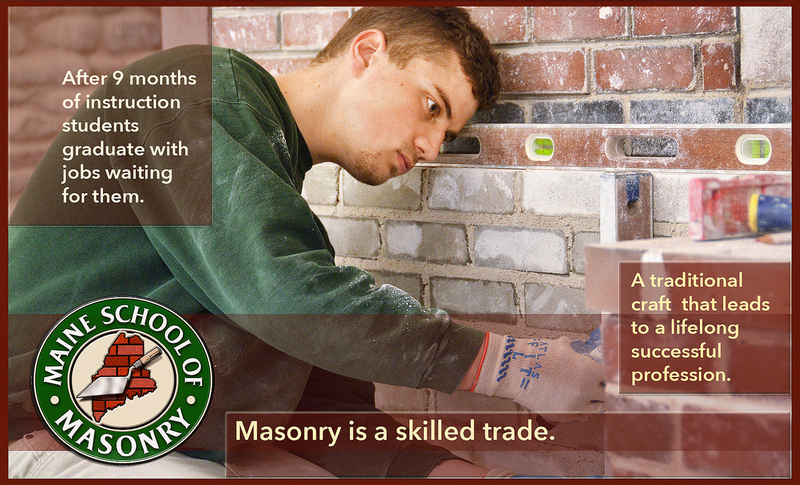 The private, post-secondary program offers a nine-month general masonry program and a nine-month program in restorative masonry. The restorative program teaches specialized skills for masonry restoration projects involving historical buildings, an in-demand skill in the Northeast. Mitchell says he started the program out of frustration with a lack of investment in career technical programs by public education. Mitchell says many students could benefit from training in masonry and construction trades, but for many years those opportunities have been few and far between in public education. Mitchell says societal changes and a decline in home handiwork has also contributed to a drop off in students taking interest in construction-related jobs. The Maine School of Masonry trains a handful of students each year, but Mitchell hopes to continue to grow the program. Mitchell says his students can quickly find work after graduation. Chandler Ellis, of Vienna, Maine is currently enrolled at the Maine School of Masonry. Ellis, 19, joined the program directly out of high school. Ellis is taking advantage of work opportunities provided by the school, earning $18 per hour while learning on the job. Ellis is currently enrolled in the school’s restorative masonry program. Mitchell says that his program and resurgent career technical programs in high school will help fill the ranks of masons, but if the industry really wants to recruit a new generation of masonry workers, they need to extend their outreach to younger students. Mitchell conducts short-term workshops at elementary and middle schools in Maine. Mitchell spends about a week in each school, teaching students masonry basics. Mitchell says middle school is the perfect time to help students develop an interest in masonry. In the past, career technical programs enjoyed strong government support. The first federal law funding vocational programs passed in 1917, years before each state made education compulsory for children. In the 1980s, career tech programs began to decline as states focused more on preparing students for college. States increased the number of core academic courses required of students and reduced funding for career technical programs. A social stigma against career technical programs also arose, as educators and popular culture reinforced the idea that a four-year college degree was the only path to prosperity for students. These changes took a toll on high school career technical programs. Between 1990 and 2009, the number of career technical credits earned by high school students in the United States dropped by 14 percent, according to The Brookings Institute. The tide is beginning to turn, however, as policy makers have seen that unfilled, good-paying jobs exist in skilled labor and are changing priorities to address that gap. In 2015, 39 states passed 125 new laws aimed at revitalizing their career technical programs. Montana doubled its funding for high school career technical programs, while Nevada tripled its state budget for these programs. Jocquette Carroll teaches masonry at Dothan Technical Center, a career technical center in Dothan, Alabama. Carroll’s program is one of a handful of masonry programs in the state. Carroll says that after years of decline, the state is beginning to invest more in career technical programs. Career technical education can have a major impact on students’ employment outcomes. A study of a nationally representative sample of 12- to 17-year-olds that began in 1997 and continues to track this cohort found that career technical education participation is linked with higher wages. The study found that students who took upper-level coursework in career technical programs tend to have higher wages. Carroll says he has a wide range of students in his classes, including both college and career-bound students. Torreon Underwood takes honors academic courses and is enrolled in Carroll’s masonry class. Underwood plans to go to college but says he wanted to learn masonry skills as a secondary career choice. “I don’t want to be a person who has to be worried about how they’re going to earn a living,” he says. James Ward, also a student at DTC, plans to pursue a career in masonry. Ward says that without the program, he probably would never have considered a career in masonry. Students in Carroll’s program can earn National Center for Construction Education and Research Certification. Carroll says students who complete his program are prepared for entry level jobs in the masonry workforce, where they can begin at between $15 and $25 per hour, a good starting salary for the area. Carroll says that the potential to earn a solid starting salary straight out of high school is appealing to many of his students. Labor unions and community colleges are also playing a big role in producing qualified new workers for the masonry profession. Organized labor has a vested interest in replenishing its ranks to allow unions to continue to provide contractors and construction firms with a reliable pool of skilled masonry labor force. Many community college programs work with labor unions to provide training to students. In Ohio, Cuyahoga Community College partners with Bricklayers Local Union 5 to provide a bricklayers apprenticeship program. The program has been running since 1997 and enrolls about 150 apprentices each year. Students take general education classes at the college and attend technical classes at an off-site center run by the union. The Cuyahoga Community College program prepares students to earn an associate’s degree in bricklaying and allied crafts and to earn journey-level status in bricklaying. University officials say the program provides excellent career prospects to students, and that the partnership between the union and the college ensures that students get the academic and practical education they need to succeed. Union participation isn’t as high as it was in years past; public policy and societal changes have chipped away at membership. Ed Navarro, south region director for the International Union of Bricklayers, says that’s creating a problem for contractors and construction firms, who may be able to find laborers, but may not always be able to find skilled ones. “Union training has always been the best training,” Navarro says. Marketing is critical to efforts by unions and educational institutions to recruit new talent. Bob Arnold is the national director of apprenticeship and training for the International Masonry Training and Education Foundation, which provides training, certifications, and continuing education to members of the International Union of Bricklayers and Allied Craftworkers. Arnold says meeting young people where they are – reaching out to them using the mediums they’re familiar with – is important to recruiting new workers. Arnold says his organization has increased their online marketing efforts and have pitched the teamwork aspect of masonry to Millennials and younger students – who are more collaborative that generations past. “We try to emphasize that you’re part of a team and that you’re building something tangible that you can take pride in,” Arnold says. Private industry, public education institutions and labor unions are all contributing to efforts to replenish the pool of skilled masonry labor force, and these efforts are creating results. Continued support for training and recruitment efforts is critical as the industry faces a tight deadline and a difficult challenge. “In the next five to 10 years we’re going to have to replace 40 percent of the masonry labor force,” Smith says. Jim Cook is a freelance writer based in Dothan, Ala.